Botanical studies showing the flowers of two hybridisations. A. Mirabilis longifloro-jalapa, the first generation cross between Angel’s trumpets Mirabilis longiflora and the Four-o’ Clock or Marvel of Peru, Mirabilis jalapa (four figures). 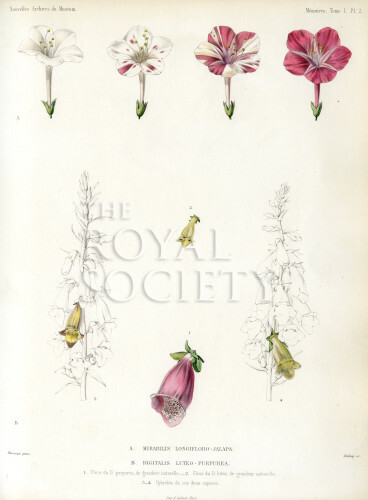 B. Digitalis luteo-purpurea, a supposed cross between the Yellow foxglove Digitalis lutea and the Common foxglove Digitalis purpurea (four figures). Plate 2 accompanying the paper ‘Nouvelles recherches sur l’hybridité dams les végétaux’, by Charles Naudin, Nouvelles archives du Muséum d’Histoire Naturelle…’ v.1 (Paris, 1865) pp.25-176.